Closest matchup: After knocking off the highly regarded Resident Evil 4 in the first round, Star Fox 64 fought valiantly in the second round but saw its Cinderella story come to an end against fellow N64 game, Banjo Kazooie. Biggest Blowout: Adventure beat out action as the classics of Chrono Trigger and Legend of Zelda made short work of Donkey Kong '94 and Mega Man 3 respectively. 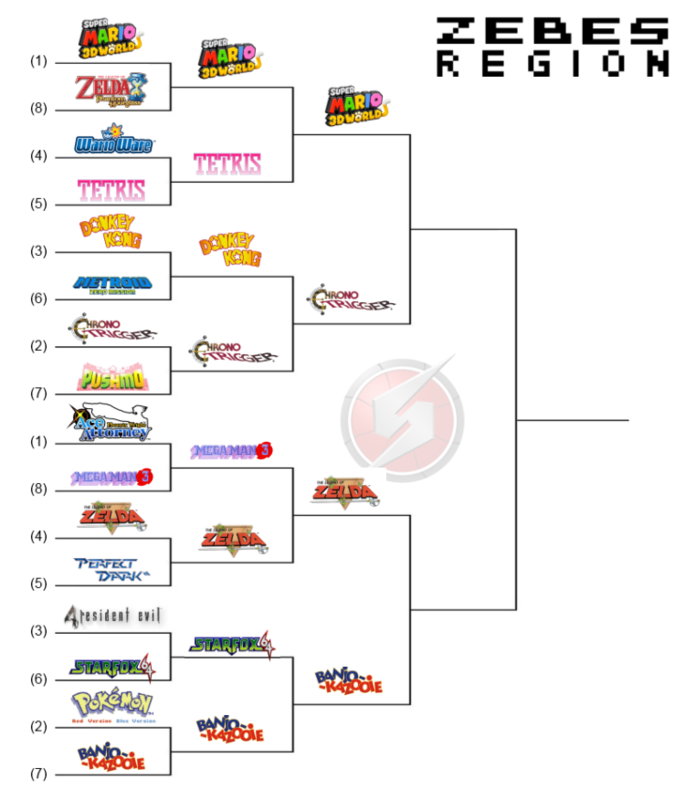 Lowest Seed Standing: Banjo Kazooie, Rare's beloved take on the Mario 64 formula, moved on as a seven seed, the only game seeded in the bottom half that has survived in the Zebes bracket. Anyone want to take a stab at the odds of Jargon ragequitting if Banjo takes out Zelda? I think it does in my book. There have been many better Zeldas since. Banjo is still a highlight for me. It won't be a ragequit, it will be me realizing this site isn't worthy of my tournament. A shame about Starfox, but it went down to a worthy adversay. Incidentally I just beat Banjo Kazooie for the third time on the weekend- Came in with a sub-9 hour time. Probably could do way better if I really tried, (I know the record is something ridiculous) but it's a PB for me so I'm happy with it. Does Jargon hate Banjo or something? Heathen. I'm still pretty stunned that RE4 got booted in the first round. Weirdly, I think it would've beaten BK, while SF64 lost to it. Kind of a paper-rock-scissors thing. But that's just a gut feeling, I guess.